Summertime and corn on the cob go hand in hand! Corn is a whole grain with many phytochemials to help you fight off cancer and keep your heart and eyes healthy! Corn is one of Super Crew kid Marcus’ favorite foods because of its fight-o-chemicals! However, often times we load corn on the cob with butter and salt, adding lots of unnecessary fat and sodium to our meal. The next time you’re making corn on the cob, steer away from the butter and salt and get creative with your corn! 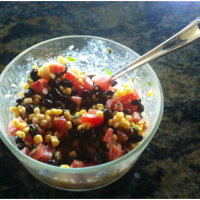 But even better yet… cook extra corn on the cob and make this delicious colorful corn salad for a tasty new twist! Add dressing to salad ingredients and toss. Your colorful fresh corn salad sound delicious! I always try to buy organic when it comes to my fruits and vegetables, they are free of chemicals and pesticides and definitely taste better. I usually wrap my corn on the cob up in foil and grill on the barbecue, no need for anything else, the taste is amazing! I have to say, quite yummy!